As someone who has dreamed about going to Japan to teach English while continuing to be an artist, this comic is dang inspiring. I really loved all the adorable stories from your time as a teacher. Especially the ones about hilarious miscommunication! I am an elementary art teacher so I can 100% relate to all the awkward and scary situations that happen when you teach! 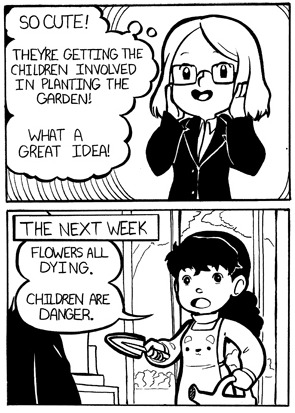 Your comic provides great incite into the life of an educator in a foreign country . I also really like how you switch between writing in romanji or in brackets when Japanese is being spoken by your characters. Its like getting nice little bites of the Japanese language without being confusing or overwhelming. Your art is super cute! Super wonderful story! Thanks for sharing these fun memories in your comic! All Images Copyright Mary Cagle.